NEW YORK (AP) — How do you measure a chicken’s happiness? Is it in the way it runs for food? How much time it spends preening? 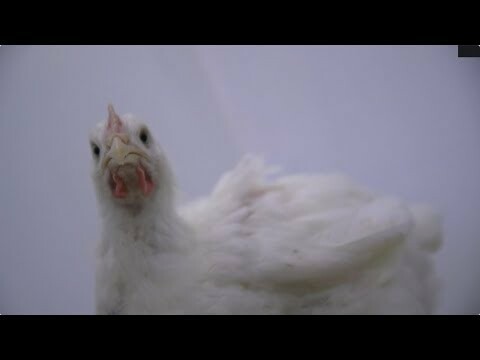 To size up what might make chickens happy in their brief lives, researchers at the University of Guelph in Ontario, Canada, are putting 16 breeds through physical fitness and behavioral tests. They’re watching how well birds scramble over a barrier for food, how skittish they seem and whether they play with a fake worm. Chickens can’t say how they feel, but playing with a fake worm may be a sign of happiness. “We have to infer when an animal is happy or content or experiencing pleasure based on their behavior,” said Stephanie Torrey, one of the researchers. Animal welfare advocates say cruelty begins with birds that have been bred to have breasts so big they can barely walk. They say today’s chickens are genetic monstrosities crippled by pain and that the industry needs to switch breeds. Many in the industry say there’s no problem and that chickens may not move around a lot because they’re sedentary. Even if they were to agree to change breeds, it’s not clear what the alternatives should look like. The two sides disagree about the cause and frequency of health issues among broilers chickens. Tyson and Sanderson Farms, for example, acknowledge that chicken breasts have ballooned over the years, but they say they’re not seeing widespread problems as a result. “If they can’t move and get to the feed trough, they’re not going to survive,” said Mike Cockrell, chief financial officer for Sanderson Farms. John Glisson of the U.S. Poultry and Egg Association says broiler chickens are “couch potatoes” and that some people may mistake the birds’ laziness for a medical issue. He said trying to assess welfare is tricky beyond established industry measures, like whether a chicken dies from disease before it’s slaughtered. The industry says changing breeds is unnecessary, and that switching to broiler chickens that don’t grow as big or as fast would mean using up more water and other resources. Chicken prices at the supermarket would be higher too. Still, animal welfare is becoming a bigger public relations concern, and companies say they’re always looking for ways to take better care of their chickens. “It is crazy for anyone to have to remind the industry that birds naturally walk,” said Josh Balk, the Humane Society’s vice president of farm animal protection. The companies say they already track health and welfare, but that they’re interested in the research. The Guelph study is being funded by the Global Animal Partnership, which certifies corporate animal welfare standards. In 2016, it launched a campaign to get companies to switch to “slower growing” breeds. Since then, it has acknowledged that chicken welfare is more complicated than just growth rate. It’s now pushing for a “better” chicken, and hopes the study will help define what that entails. Anne Malleau, the group’s executive director, notes some of the researchers’ tests may seem far out. But she said providing “enrichments” — such as places where chickens can rest or perch — was also seen as a fringe idea before becoming more accepted. GAP was founded a decade ago with funding from Whole Foods, which still pays Malleau’s and another staffer’s salaries. Back in Guelph, researchers note that chicken traits can make for marketable imagery. That includes behaviors like their willingness to engage with a fake worm — which they note may be misinterpreted as “playing” and happiness. “The jury’s still out whether domestic chickens, with their comparatively smaller brains, have the capacity to play,” Torrey said.